Parent’s Night Out is a great opportunity for Moms and Dads to enjoy a night out while kids have a blast! Games, Pizza, fun theme nights, and more make PNO a night the whole family loves. 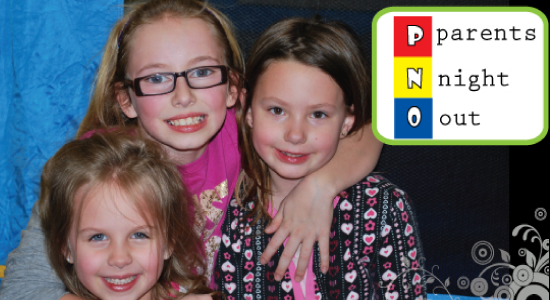 What age groups can attend PNO? PNO is for babies (6 weeks and up) – 5th graders. When you check in, our system records your cell phone number for contact purposes. Can my children attend PNO, even if we are not members of Northview? Certainly! And we’d love to have your family visit on a Sunday morning as well. Does it cost anything for my child to attend Parents Night Out? No, Parents Night Out is completely FREE!!! Do I have to register and how do I register? Yes, You do need to register for Parents Night Out. Your registration needs to be completed by Thursday at midnight the day before the Parents Night Out. This helps us to prepare for enough food and volunteers.